Life is so full of serendipitous happenings. Some feel so linked that they could be called examples of synchronicity, a philosophical concept, developed by none other than Carl Gustav Jung, that explains the experience of two or more events that "are apparently causally unrelated or unlikely to occur together by chance and that are observed to occur together in a meaningful manner." Jung believed that synchronistic events reveal an underlying pattern, a larger framework; i.e. that stuff doesn't happen only by chance. 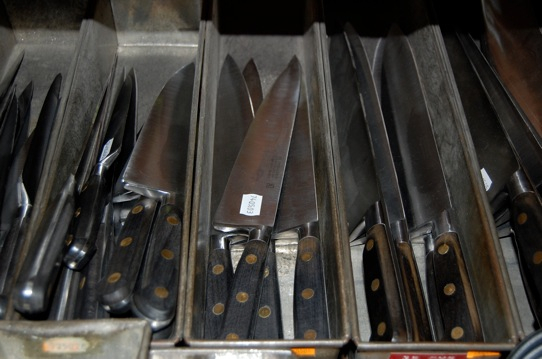 Knives on the shelf at Dehillerin. An example: the other day my friend Linda gave us a gorgeous oyster shucking knife (above) that she brought back from a trip to Paris. She'd been visiting her daughter, who was in school in that magical city, and had a few hours on her own to explore the city. 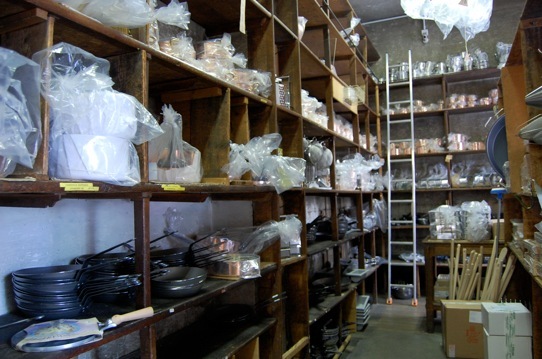 A consummate chef, she went to the legendary kitchen supply store Dehillerin. Browsing the shelves of this store that hasn't changed its layout much since it opened in 1820, with high wooden walls and crowded layout, she ran across this knife that, as she explained it, only requires the shucker to point it at an oyster and the creature will pop open its shell in submission. The high tech "retail display" at Dehillerin. Then, and that's when my story gets interesting, the next day my brother texted me to get online immediately and make reservations to spend a few days in July at Paradise Creek campground. 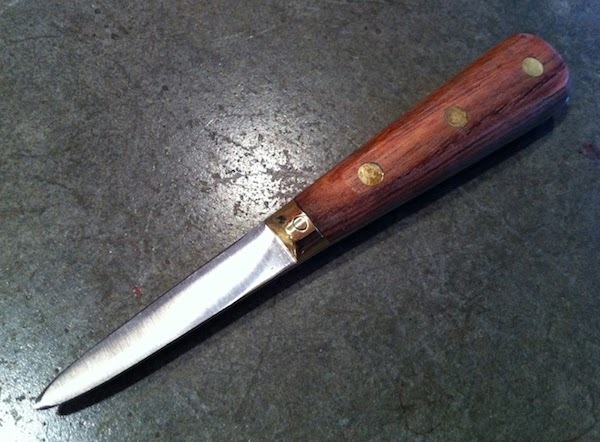 So, you're asking yourself, what does a camping trip have to do with a French shucking knife? Well, my friends, if you recall, our trip there last year involved no less decadent a treat than 14 dozen fresh oysters. See what I mean? Synchronicity at its finest. We'll be there, shucker in hand. Photos of Dehillerin by Linda Colwell.